Now about the last episode, Korra maybe correct about "destroyed" connections with the previous avatars, she may the last avatar at this very moment, but I wouldn't say Raava was destroyed in a literal sense, the title of the episode, says it all, Raava is the Light Spirit while Vaatu is the Dark Spirit, they are like or are, Yin and Yang, when there is light there is darkness, where there is darkness there is also light (Kingdom Hearts also taught me that, specially Birth By Sleep), I think this is one of the messages of this episode, Raava still exists, how she kinda vanished was also the same when Avatar Wan died, her presence became much weaker, it is the better word, it probably takes 10 000 years to restore it's full strength, the same with Vaatu, that's why Vaatu needed Harmonic Convergence, in each 10 000 years it happens, it's all connected, even Vaatu said even though they are separated, he can still feel her presence, and vice-versa, like Raava said to Vaatu, one cannot exist without the other. Also I loved, Tenzin admitting that he needed spiritual growth to go through and teaching Korra to let go of her attachment of perception of herself (about what she thinks she is), it's not Raava that defines her, but her own Korra self, her very own spirit, he said there is a way to do it, to save the world, while they were going towards the tree of time, that connects the spirit world to the physical world, Tenzin explains, "the ancient meditate in the tree and connect with the great cosmic energy of the universe (...) do what the ancient once did, connect to the cosmic energy of the universe, don't bend the elements but the energy within yourself", remember when the Lion Turtle taught Aang how to bend energy of another person, said the same... "In the era before the Avatar, we bent not the elements but the energy within ourselves." then comes what it comes, Korra successfully connect with the cosmic energy to help bend her own energy, goes towards the final and epic battle against Vaatu, it was bit like watching a battle of giants of TV show like Power Rangers, Korra couldn't find Raava inside Vaatu, but Jinora did Raava, we don't know how she did it, then Raava go inside Vaatu and Korra starts fight back and free Raava, then Korra did the Light bending on Vaatu, then he turns yellow and vanishes, I don't as being disappeared, remember Korra spirit vanished and her spirit came back to her body, I think Vaatu came back to where he come from originally, which we don't know where is. 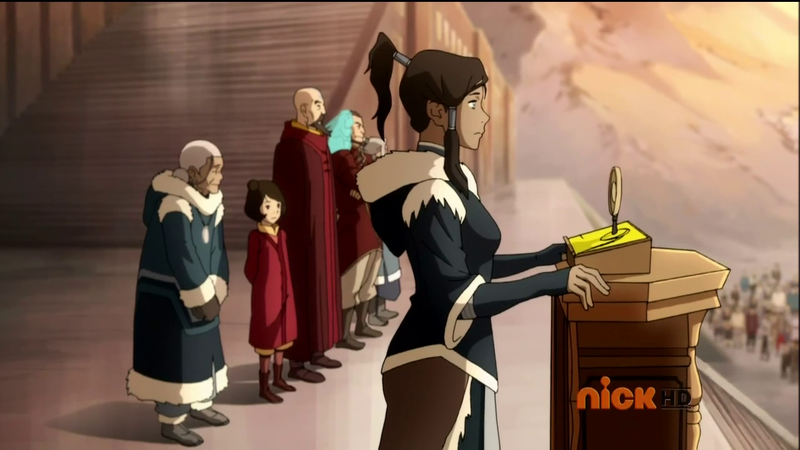 Korra fused with Raava, but her connections with the other avatars didn't came back, because it was lost from Raava too, Korra decides to not close the portals, she wonders what if the spirit world and human world weren't supposed to be apart, Korra then becomes the last avatar of the previous age of the avatar but she is now the first avatar of the new age, she is not the bridge anymore but the guide instead. Now coming to the polemic discussions, about Makorra break up, many people may disagree and many others may agree for different reasons, I'm being one of them, this was a mature and wise break up, they said themselves, even though they don't work as a couple, but they still love each other, that's what it matters most, you don't have to be a couple to love someone, to show you love someone, it won't stop caring of that person well-being, same goes for the kinds of love (friendship, family). there is more I have to say about Makorra before the break up and when they started dating, I always thought it was soon, I didn't agree of Mako and Korra decision to start dating at the end of Book 1, I think they were caught in the moment and weren't ready for this kind of relationship yet if they wanted, humans relationships - bonds takes time to become strong and, even friendship isn't exception. I love the finale very much because also quite coincide with my spiritual views just as much did episode 10 and episode 8...after it, I felt very light, like some lot of weight and pressure was out. I really wonder where it goes from now on, Book 3 Title is Change, I do look forward to watch it.